More than 80 artists and more than 20 businesses participate, all within walking distance. 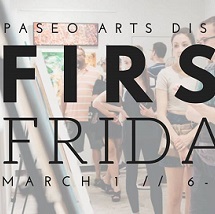 Art opening receptions on Friday night showcase the new work of the gallery/studio owners or the work of guest artists. Many galleries offer light refreshments. Cost:This is a free event. Pets: Leashed pets are always welcome in the Paseo! Parking:Parking is available along Paseo and in the surrounding Paseo neighborhood.